Buy any 2 for £40! To take advantage of this special offer, simply place two Pictures, Poems and Percussion Book & CD packs in your basket and your offer discount will be applied automatically. Alternatively call us on 020 8481 7200 to place your order. Create unique learning experiences with this series of songbooks! The Pictures, Poems & Percussion songbook collection features poems for primary school children, the first in our newest series of Big Books. 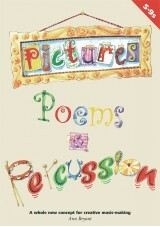 These songbooks unlock creativity in pupils, combining poetry and percussion to help encourage music-makings skills. They are also incredibly diverse, with the imagery and sounds allowing for literacy and art based activities to be explored, including the foundations for creative writing exercises to be implemented too. The introduction to poetry in particular can be of significant importance to primary school pupils, for some it will be their first experience with rhyming and exploring their artistic, musical and creative skills. That is why these books are so popular, as they let pupils explore their talents and interests whilst learning. The best thing about these books is that they give the opportunity for pupils to explore all of the above in a simple way. Innovative, effective and flexible, these books have it all already included, so teachers in particular do not need to worry about a thing! Ignite the flame of creativity within children and explore the Pictures, Poems and Percussion collection today, you won’t regret it.